Day three of the Spring Break Las Vegas burger crawl for me and Happy Meal. Postrio had been on tap for some time, and we were already at The Venetian checking out the eternally crepuscular Saint Mark's Square. Unfortunately, this Wolfgang Puck establishment delivered the culinary equivalent of "bad touch" from mom's new boyfriend. I should have known that everything was going to go terribly wrong from the painful interaction with the server..
Me: What are the cuts of beef in the burger? Me: That is a type of cow. I am more interested in the parts of the cow that the meat comes from so that I can order my burger cooked to a temperature that is most appropriate. Can you please go check? Me: Am not trying to be a pain; I am trying to order the burger correctly so that I can properly review it. She: That will be pink throughout. Me: Yes, that's what Medium means. I assumed that she was new or fussy or just plain bad at her job. I failed to take this as an omen. This was as good as it was going to get. It seemed that Postrio was Italian slang for "pig awful." We ordered a couple of the $17 1/2 pound Angus burgers and settled in for a 20-minute wait. It takes 20 minutes to create something as thoroughly jacked up as what showed up at our table. Looking back, I should have noted that the restaurant was all but empty in the middle of the bustling St. Mark's Square. 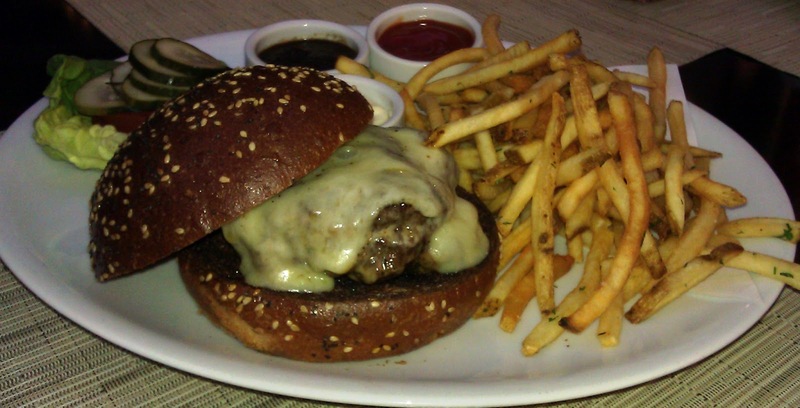 The Beef: The burger meat at Postrio was a blend of Sirloin and Chuck. The source of the beef remains a mystery--no one could seem to figure that out. The beef was flavorful and beefy. Sadly, it was over-cooked and rubbery. The burgers were formed during morning prep by someone that clearly had a beef with burger meat. 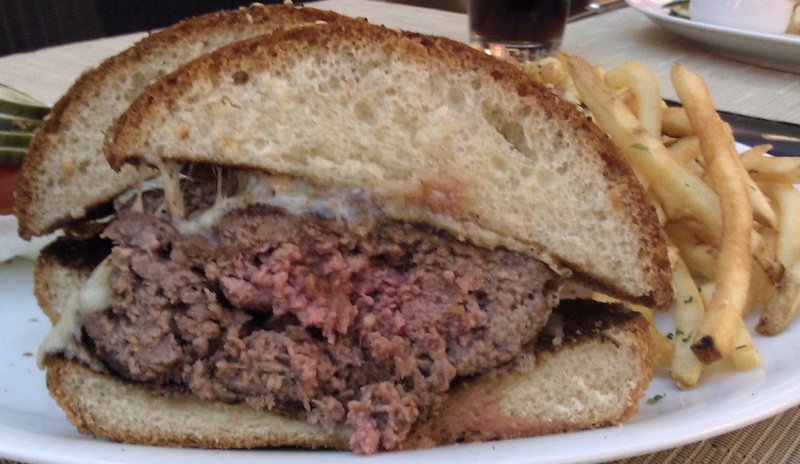 The over-manipulation of the coarsely ground beef caused a great many unwelcome new protein bonds.This fresh bonds caused the burger to take on the shape and texture of a fist. Beyond that, the burger was peppered with connective tissue. Sloppy on all counts. This was unfortunate, because the flavor was there along with a trace of mineral flavors. The was no funk from aging. The Seasoning: The burger's exterior tasted like an oniony salt. It was as if it had been dusted with onion soup mix. This was unpleasant. The Sear: Ragged and half-assed are the words that come to mind. It wouldn't have mattered, though. Nothing could have saved the rawhide chew toy that was my over-worked and nearly solid burger patty. The Preparation: The kitchen at Postrio phoned it in and subsequently dropped the ball. After I sent my meal back, there was no offer for a refire or a make-good of any sort. Apparently, that was their best effort. The Cheese: The Vermont White Cheddar was spectacular. The Cheddar was well-aged with that wonderful granularity that comes from salt crystals and the creaminess from the fat. That Cheddar lent enough of an iron note to fill in for the beef. The cheese, however, could not carry the dish. The Bun: I would have referred to this as a sh!tshow, but that would have insulted shows about sh!t the world over. The bun was stale and dry--incredibly dry and stale. The bun was burned to the point of tasting like carbon. The bun was toasted on a griddle, and the bottom of the bun had black grill marks, which imparted a nasty bitterness directly to the tongue when attempting to eat the dry, rubbery, over-cooked burger. The Meat To Bun Ratio: The giant, stale, burned bun overwhelmed the dry, rubbery, gristly burger patty. The Toppings: The onion marmalade was delicious and properly reduced. The pickle chips, lettuce, and tomato were all just right. The Fries: The fries at Postrio were terrific. These were perfectly crisped and perfectly seasoned shoestring fries. The Value: Say what? I was relatively certain that Postrio saw great value in charging me for two meals that could not be eaten. The manager, Luckas, agreed that the bun was burned and stale and that the burger was rubbery. I sent my plate back after a scant 3 bites. Happy Meal soldiered through a third of his before he gave up due to the strong flavor of charcoal. I was granted the "friends and family discount." That meant that our soft drinks were at no charge. So, Postrio only charged me $37 for that shameful mess. Looking back, Postrio did provide a certain value in terms of weight loss. The pricey, inedible food certainly reduced my caloric intake for the day. Can Wolfgang Puck make a burger...NO! Caveat emptor. Postrio may have been good once. It may be good again some day. However, on the day that I visited, the quality of the burger and service was excremental, and that was being generous. Burger Review : Don't. Just don't. Front and back of house were a well-oiled machine designed to lighten wallets and deliver awful food. Postrio earned the title of worst burger in Las Vegas. 07APR13--I did reach out to the Wolfgang Puck organization twice to communicate this experience to them...they have not yet replied. 12APR13--The manager of Postrio reached out to me...he refunded the price of the meal. Fantastic review. Interesting and deep as usual! You wrote that the manager agreed that the bun was stale and the meat was rubbery. Did you cram the burger between his teeth? How did he come to know this? This was sad for me, as I had the best burger of my life at Wolfgang's Steakhouse in Beverly Hills. Wolfgang's Steakhouse is owned by Wolfgang Zwiener or Pete Luger's fame. The burger at Postrio was bad enough that one could tell by simply touching it. Besides, the bun was burnt. Wow, I had no idea Wolfgang's wasn't Wolfgang's. The great burger there makes so much sense to me now. Despite the frequent misunderstanding, Puck says, "I said I'd be a nice guy and not fight him. He was a waiter his whole life, and it wasn't in our backyard, even though it created confusion." Zwiener's burger was orders or magnitude better than Puck's inedible concoction. The Zwiener burger is the best in LA (since Miru Jung closed his doors). George Petreli's Famous Steaks knocked it out of the park, too. The also age and grind their own beef on site. Like Wolfgang's Steakhouse, they don't overcharge for Chuck. They use Sirloin and Filet.